Looking for a new way to display your instax photos? Tap into your inner crafter and storyteller by creating this unique and colourful instax scrapbook. Including your instax mini prints in your scrapbook will help you relive your memories and record every detail. Whether you’re creating a family keepsake, a personal memento or gifting your handmade instax scrapbook to a loved one, this project is perfect for documenting travel adventures with friends, weddings, family beach days and other special moments worth remembering. Fujifilm instax is equipped with all materials needed for this project; simply use the new accessories crafts range to help you pick out your favourite materials. Step 1: Pick a theme. Create a layout on a double-page spread with complementary colours and work in sync with your chosen theme. For example, if your theme is beachy, you can choose colours such as aqua for the ocean and yellow for the sun. Step 2: Pick photos that work best with your theme, such as a weekend getaway to the coast, forest hiking or recording landmark moments of your child’s first year. Step 3: Take your favourite decorations (again, make sure your materials support your visual theme) and rearrange them in different areas of your page until you find the perfect layout. Step 4: Once you’re satisfied with your photo arrangement, secure them to the page with your colourful washi tape. Use photo corners to add an extra element of design or pop of colour. Step 5: Use your storytelling skills to describe each moment. Pro tip: Write your photo descriptions on a scrap of paper first, then copy onto the scrapbook page. Or use your washi tape to secure the scrap of paper to the page. This way, you’re less likely to make a mistake. Step 6: Decorate the extra space with scrapbook cutouts that work with your theme. For example, If you document a hike, adorn the page with nature-themed cutouts along with shades of green and brown. Congratulations, you have completed your first page! Repeat this process for each additional page. 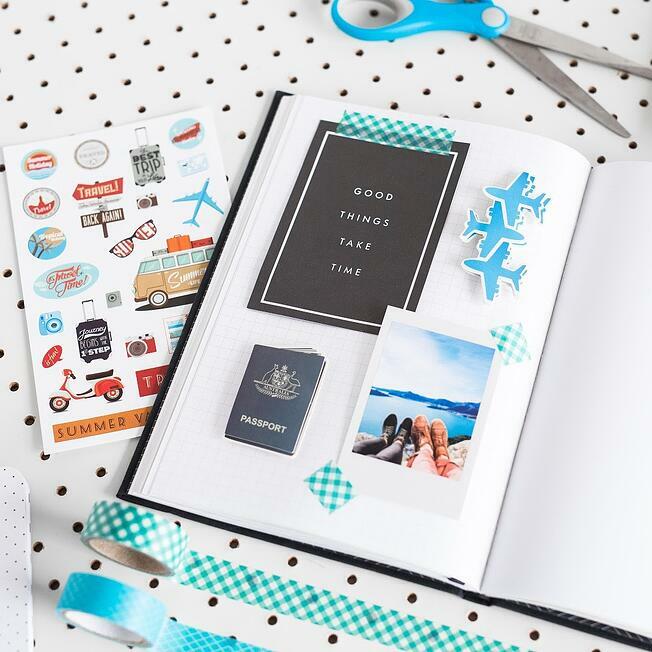 You can dedicate your instax diy scrapbook to one event, or decorate each page with a new adventure. Whatever you choose, be sure to exercise your personal creativity and have fun.